Revised estimates of Gross Domestic Product (GDP) in the first quarter of this year showed further deceleration—down to 2.0 percent from 2.9 percent in last year’s fourth quarter. However, conditions remain favorable for much stronger growth in the second quarter, backed by a narrowing trade deficit and upticks in business and consumer spending. We forecast real GDP growth of 3.4 percent in the second quarter and 2.7 percent for all of 2018. The U.S. labor market continues to be robust, now at 93 consecutive months of job growth. Although the unemployment rate ticked up to 4.0 percent in June, the increase was mainly the result of more people looking for work. The labor force participation rate also increased two-tenths of a percentage point, to 62.9 percent. Despite the strength in the labor market, average hourly earnings grew 2.7 percent year-over-year. We expect job gains to hold steady, with the unemployment rate averaging 3.9 percent and 3.8 percent in 2018 and 2019, respectively. The 30-year fixed mortgage rate has been slightly declining since mid-June and was 4.53 percent in the second week of July. Rates have stepped back because of declining long-term Treasury yields, which continue to be pushed down by anxieties from a potential trade war. 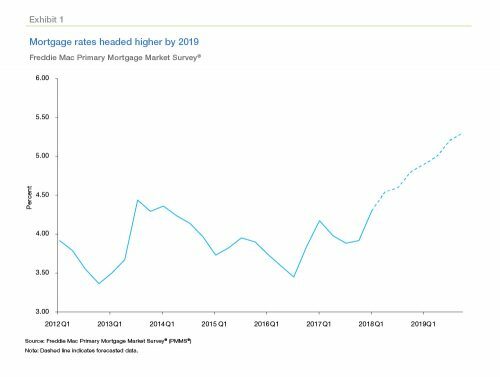 Our forecast has the 30-year fixed-rate mortgage averaging 4.6 percent this year, and rising to 5.1 percent next year. The pace of existing-home sales has been disappointing this year, as tight inventory conditions continue to suppress overall activity despite solid demand. 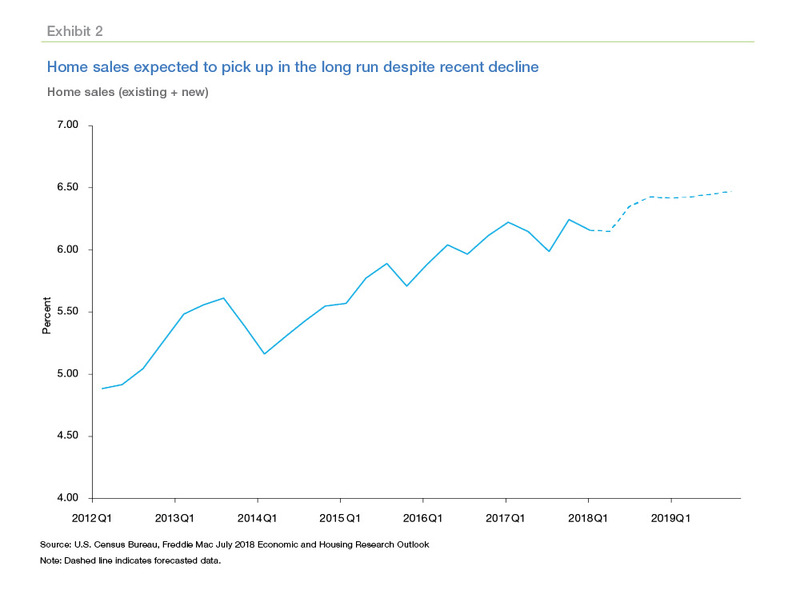 Conversely, new home sales continue to rise, with homebuilders increasing production – albeit slowly. Our forecast for total home sales (new and existing) remains unchanged. We expect modest sales growth over the next two years, with 6.27 million sales in 2018 and 6.44 million in 2019. Increasing housing demand amidst tight supply continue to lead to rising home prices. The strength in new home sales should help moderate home price growth by 2019. We anticipate home price growth of 6.7 percent this year and 4.8 percent next year. Historically, our monthly forecasts have estimated total single-family originations, including second liens and home improvement loans. With the release of this month’s forecast, we are revising our estimates to include only first-lien, single-family mortgage originations (excluding home improvement loans). This adjustment more closely aligns our estimates of total single-family originations with those of the Mortgage Bankers Association and Fannie Mae, among others. We have re-estimated total single-family originations back to 2004 using this revised approach; Exhibit 5 shows our re-benchmarked historical estimates. 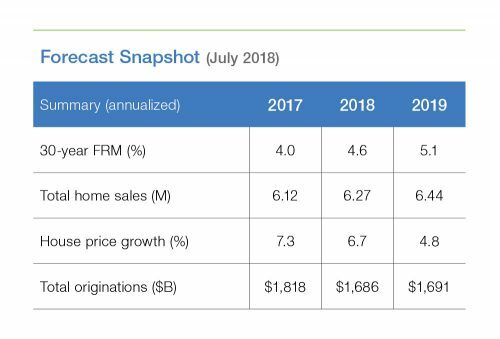 This year, we forecast single-family first-lien mortgage origination volume to be $1.69 trillion, down 7 percent from last year. 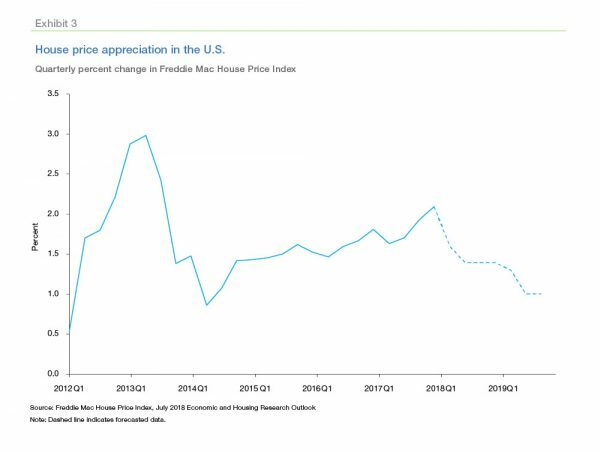 We expect origination volume to be flat next year, but with activity continuing to shift from refinance to purchase due to higher mortgage interest rates. Purchase origination volume is forecasted to be $1.19 trillion this year and $1.29 trillion next year.